Rendering of proposed Crescent development in downtown Columbia. Click for high resolution version. Image © 2014 Howard Hughes Corporation; used with permission. tl;dr: The Crescent development in downtown Columbia is going to be a (very) big deal. The approved outline proposes 2,300 residences; a 250-room hotel; 1.475 million square feet of office space; 313,000 square feet of retail and 225,000 square feet of civic and cultural uses spread throughout four development areas on the property. A map of the parcels and lots comprising the parts of the Crescent neighborhood covered by FDP-DC-Crescent-1. Click for high-resolution version. Image taken from page 3 of FDP-DC-Crescent-1, “Final Development Plan, Downtown Columbia, Crescent Neighborhood Phase 1”. 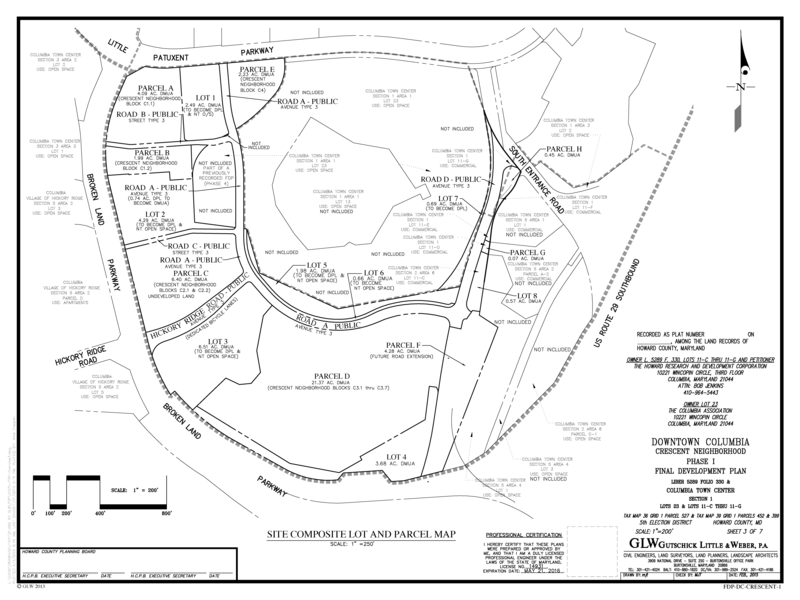 Area 1 includes Parcels A and B on the map shown, in the northwest corner of the Crescent development near the intersection of Broken Land Parkway and Little Patuxent Parkway. It is intended for office use along with a hotel, with some retail and restaurant space. Area 2 includes Parcel C on the map, south of Area 1 on the east side of Broken Land Parkway. It is intended for mixed office and residential uses, with some retail and restaurant space. Area 3 includes Parcel D on the map, south of Merriweather Post Pavilion and north of Broken Land Parkway. It is intended as the main “downtown” of the Crescent development, with office and residential uses, a much larger allotment of retail and restaurant space, and cultural and community facilities. Area 4 includes Parcel E on the map, east of Area 1 just south of Little Patuxent Parkway. It is intended primarily for office use, with a small amount of retail and restaurant space. There is also a significant amount of space that will be left undeveloped , including Lots 1, 2, and 3 on the map shown. 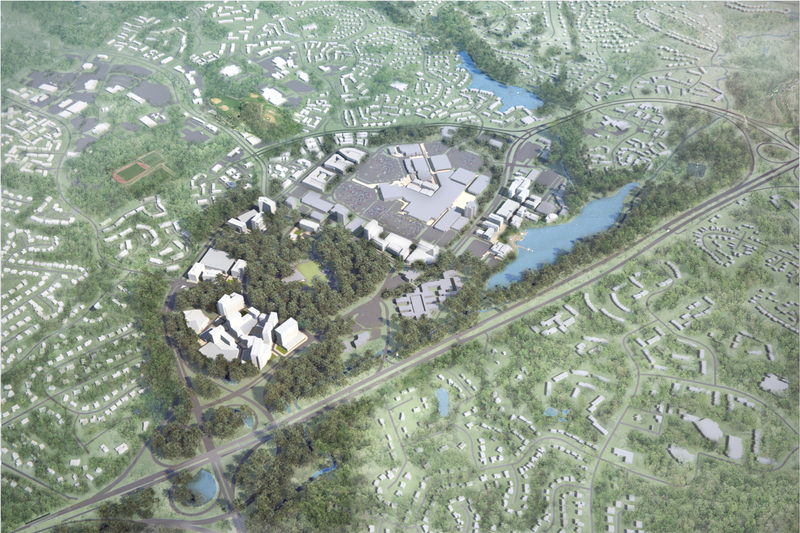 These will serve as natural open space for the project, and can be considered extensions of the western and southern portions of Symphony Woods. The table below summarizes all of the uses proposed for Areas 1 through 4, including the associated square footage and related details (from page 1 of FDP-DC-Crescent-1). The final development plan does not describe the exact nature of the 225,000 SF of “Cultural/Community” space in Area 3. However in the pre-submission meeting Howard Hughes representatives discussed building in Area 3 a new Central Branch library (100,000 SF), a conference center (50,000 SF), an aquatic center (50,000 SF), and an indoor concert hall (25,000 SF). In the pre-submission meeting Howard Hughes representatives also discussed locating all 2,300 residential units in Area 3 along with the 250-room hotel; no office space was planned for Area 3. The final development plan moves the hotel from Area 3 into Area 1, moves 500 residential units from Area 3 to Area 2, and puts 400,000 SF of office space into Area 3. One major omission in the final development plan (really, the major omission) is a detailed discussion of parking. The slides presented in the pre-submission meeting contained detailed information on the number of parking spaces to be provided in each area through either surface parking lots or parking garages (which would eventually replace all the surface lots). None of that is in the final development plan. Apparently the exact parking arrangements will be covered in the site development plans to be submitted for each area, including proposals for how to compensate for the loss of the current gravel lots used for events at Merriweather Post Pavilion. As I noted in discussing the history of Howard County Council redistricting, on the tenth anniversary of Columbia former county commissioner and council member Charles Miller expressed regret that Columbia had ever been created. Now as Columbia approaches its 50th anniversary, current County Executive Allan Kittleman has promised that he will work to “[attract] large businesses to downtown Columbia so it may truly become the economic engine for our County”. The Crescent development will be the key to making that happen. This entry was posted in howardcounty and tagged crescent, downtowncolumbia, howardhughes on March 22, 2015 by hecker. The pre-submission community meeting for Parcel A is scheduled for Thursday, Mar 26, 6:30pm, at Oakland Manor Ballroom (5430 Vantage Point Road). The proposal lists “approx 360,000 sq of office/retail space; 1200 +/- space parking garage,” 301-421-4024 for more information. I forgot to include a note about the pre-submission meeting; thanks for mentioning it! 360,000 SF is only a bit over half of the 600,000 SF approved for Area 1, so I presume there will be a second office building proposed later (along with the hotel). Thanks once again, Frank, for a great, readable summary. You’re quite welcome, glad you found it useful. Unfortunately I didn’t get a chance to go to the most recent pre-submission meeting, so I don’t have anything to add beyond the published stories.